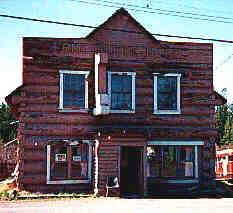 70 Mile House, British Columbia, located north of Clinton, was one of the first historic roadhouse locations on the famous Cariboo Wagon Road. It now marks the turn off point to the Green Lake and Watch Lake recreation areas. The road east makes a wonderful backroad circle tour right through to the communities of Bridge Lake and Lone Butte on BC Hwy 24. The surrounding lakes are home to many fishing resorts, guest ranches, provincial parks, and of course a thriving wildlife population. Some of the best outdoor family vacations in British Columbia can be enjoyed within a few miles of 70 Mile House. Full services, including gas, propane, groceries, dining, accommodations, neighbourhood pub and a post office are available here. Gateway to the Interlakes area, Lone Butte is a small community on Hwy 24 about 11 miles east of 93 Mile House. Once one of the Cariboo's largest towns, Lone Butte was a centre for ranchers who settled in the area, from the early 1900's to the 1950's. Cattle were driven here and shipped by rail. The old log Lone Butte Hotel, now gone, used to house many a famous person, including the occassional movie star. All the amenities including a general store, cafe, neighbourhood pub, sporting goods store, craft shop, service station and post office can be found in this friendly south Cariboo village. Resorts and accommodations are available in the surrounding area which features over 50 lakes. The Lone Butte, an extinct volcano core, for which the community is named, is seen to the east. A historic water tower, formerly used by passing steam engines, has been preserved in the townsite. The small community with the peaceful name of Forest Grove, is about a 20 minute drive from 100 Mile House. 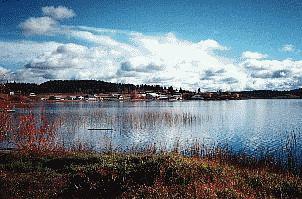 Forest Grove is the departure point to beautiful Canim, Ruth and Gotchen lakes. Enjoy first class, full facility lodges, excellent fishing, a provincial campsite, a wide range of exciting adventure activities, and fine dining all within a short drive of Forest Grove. Also found in the Forest Grove vacinity are Hendrix Falls, Deception Falls, Mahood Falls and Flourmill Volcanoes. The community itself offers a general store with groceries, bakery items, dining, and a service station. When a fur trader dropped his axe into a remote Cariboo lake, he probably never suspected that it would be the basis for the name of La La Hache. "The Longest Town in the Cariboo" is located about 20 km (12.4 mi) north of 100 Mile House on Hwy 97, and stretches along much of the 18 km (11 mi) lakeshore. The lake is well known for its kokanee fishing as well as it's trophy size lake trout. During the summer months, the area attracts boats, swimmers, and water skiiers. 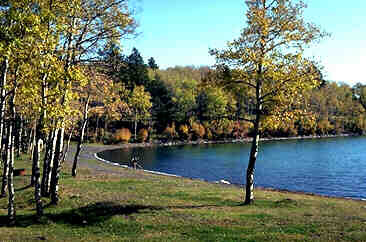 Many resorts, offering camping and cabins are located on the lakeshore, as well as a provincial campground. Close by, Timothy lake is a popular holiday destination. In the winter, Mt.Timothy offers downhill skiing, and the area is a favourite for snowmobiling, cross country skiing and ice fishing. The town of Lac La Hache offers full services including an excellent fly and tackle shop.